We recorded jaw-muscle EMG patterns during chewing in five Belanger's treeshrews (Tupaia belangeri). All subjects were healthy adult males that weighed between 150 and 250 g. We habituated individuals to accepting food prior to recording EMG data. Our goal was to record EMG data from each treeshrew during three separate experiments. However, for reasons unrelated to our work, treeshrew 1 was available for only one experiment. Figure 3. Lateral view of a treeshrew skull and jaw muscles. The dots depict the approximate placement of EMG electrodes in this study. 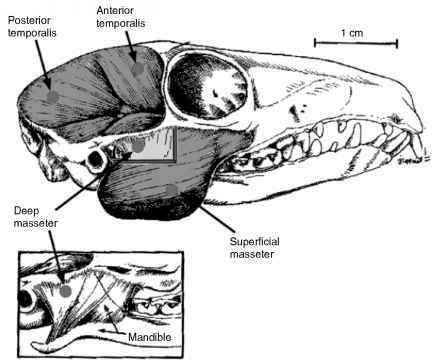 In the inset, we have removed the superficial masseter in order to show the morphology of the treeshrew deep mas-seter. We inserted the deep masseter electrode by pushing the electrode through the superficial masseter and into the deep masseter. (Modified from Fish, 1983). placed the subject in a restraining sling-suit that allowed free movement of the head and neck. To insert an electrode, we placed the tip of the electrode in a 27 gauge needle and inserted the needle in the appropriate muscle until the needle's tip contacted bone. We then removed the needle leaving the electrode in the muscle near the bone. We placed electrodes in the superficial masseter by positioning the needle (with inserted electrode) midway between the muscle's anterior and posterior borders and inserting it until it contacted the lower border of the mandibular angle. 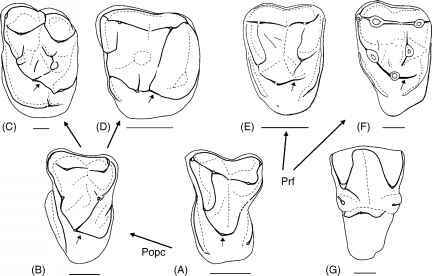 The electrode tended to be located in the middle of the muscle, rather than more inferiorly, because the inferior portion of the superficial masseter wraps below the mandibular angle to attach on the jaw's medial surface just below the medial pterygoid (Fish, 1983). We placed deep masseter electrodes by inserting the needle just below the zygomatic arch midway between the mandibular condyle and the junction of the arch and postorbital bar. We inserted the needle at approximately a 30° downward angle relative to the ramus until it contacted bone. We inserted anterior temporalis electrodes approximately 5 mm above the zygomatic arch midway between the postorbital bar and the lateralmost extent of the temporal bone. We inserted needles downward and posteriorly, both at approximately 45° relative to horizontal, until contact with bone. We positioned posterior temporalis electrodes above and behind the ear and inserted them downward and anteriorly at approximately 45° until contact with bone. We did not verify electrode position via dissection because we did not kill the animals at the end of an experiment. Electrode construction and general placement procedures are described in more detail in Hylander and Johnson (1985, 1994) and Hylander et al. (2000). We allowed the restrained animal to recover fully from sedation at which time we began feeding it dried apricots, dried raisins and crickets. We amplified and band-pass filtered (100-3000 Hz) EMG potentials from the jaw muscles during chewing of these foods and then recorded them onto a 14-channel FM tape recorder at a rate of 15 in./sec. Hylander et al. (2000) provide a detailed account of the recording procedure. We continued feeding the treeshrew until we had collected sufficient data or the animal refused to eat any more. Following data collection, we removed the electrodes, freed the animal from its restraints and returned it to its cage. All recoveries from the experimental procedures were uneventful. Processing EMG data followed the methods in Hylander et al. (2000). We selected chewing sequences for analysis by visually examining raw EMG signals on two multichannel, dual-beam oscilloscopes. We converted the raw analog EMG data from these selected chewing sequences to digital data sampling at 10 kHz and recorded the digital data to a microcomputer using LabView software. These recorded digitized EMG data were then filtered with a digital Butterworth band-pass filter (100-3000 Hz). We then calculated the root-mean-square (rms) of each digitized EMG signal using a 42-millisecond (ms) time constant (see Figure 2 in Hylander et al., 2000). All rms data for chewing sequences were calculated over 2 ms intervals (Hylander and Johnson, 1989; Hylander et al., 2000). We analyzed the rms EMG data. The magnitude of EMG potentials cannot be directly compared across electrodes because of variation in signal quality and electrode position (e.g., Gans et al., 1978; Loeb and Gans, 1986). Therefore, we scaled each electrode's signal relative to its own peak signal in order to compare relative amounts of muscle activity among the jaw-closing muscles during chewing. To do this scaling, we identified the largest peak rms EMG potential for each muscle (i.e., an electrode) during a chewing cycle in an experiment regardless of whether we thought it acted as a working- or balancing-side muscle. We assigned the peak EMG a value of 1.0 and then re-scaled all other peak values for other chewing cycles in that electrode in a linear fashion relative to this largest peak. We calculated the mean and standard deviation of W/B ratios across all chewing cycles in an experiment for the four pairs of electrodes in the masseter and temporalis muscles. W/B ratios tend to be right skewed with values above and below 1.0 (Hylander and Johnson, 1994). Log10 transformation of the individual W/B ratios helps to normalize these data (Sokal and Rohlf, 1997). Additionally, the largest peak EMG values for the left- and right-side electrodes in a muscle pair represent two, likely independent, scaling factors that affect a W/B ratio. In other words, the left muscle may have a peak rms value that represents a relatively greater amount of contraction for that muscle as compared to the peak rms value of the right-sided muscle (or vice versa). This possibility exists when an animal chews more forcefully on one side of the jaw than the other. Therefore, we first calculated the average of the logged W/B ratios for all left-sided chewing cycles separate from the average of right-sided chewing cycles. We then averaged the left and right W/B ratios to adjust for this side-related effect. Lastly, we antilogged this corrected average to provide the mean W/B ratio for that muscle pair in an experiment. We examined when the various jaw muscles were active relative to each other during a chewing cycle by comparing the timing of their peak rms signals. To provide a standardized method for comparing jaw-muscle firing patterns, we compared the time of each muscle's EMG peak to the peak activity of the working-side superficial masseter (WSM) (Hylander and Johnson, 1994; Hylander et al., 2000). If a peak EMG for a muscle precedes the WSM peak, then we reported the number of milliseconds this muscle peaks prior to it as a positive value. Alternatively, if a muscle's peak EMG occurs after the peak of the WSM, then we reported the number of milliseconds this peak is trailing it as a negative value. We calculated the mean timing of each muscle's peak activity relative to the WSM across all chewing cycles in an experiment. 4 We arbitrarily established a maximum W/B ratio of 10.0 for any single chew. Thus, if the relative working-side recruitment exceeded the relative balancing-side level by more than a 10:1 ratio, then we recorded the W/B ratio as 10.0 for that chew. We did this to reduce the likelihood that a few exceptionally large values would inflate the average W/B ratio (Hylander et al., 2000). We report treeshrew grand means for W/B ratios and jaw-muscle peak firing times as the mean of 13 experimental averages (Hylander et al., 2000). For each W/B ratio, we averaged the Log10 values from the 13 experimental means and reported its antilog as the grand mean. We give the standard deviations of the 13 logged experimental means because of the known difficulties in antilogging a standard deviation (e.g., Finney, 1941; Laurent, 1963). We also calculated grand means and standard deviations for the jaw-muscle peak firing times based on the 13 experimental means.